During the summer of 2013, the John James Audubon museum in Henderson, Kentucky invited the owner of Hamilton Color Lab, Dave Hamilton, to the museum to digitally capture and reproduce all the original works of JJ Audubon. This is just the start of what is anticipated as a long and endearing partnership. 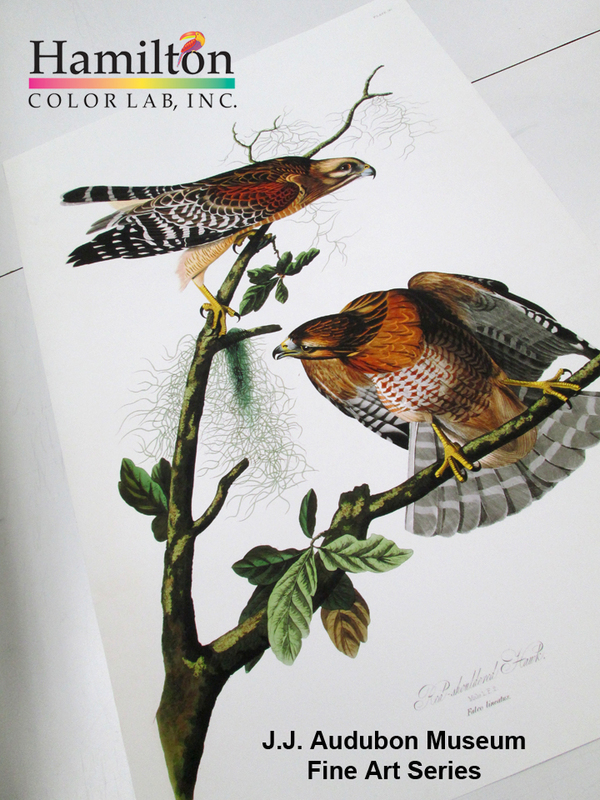 JJ Audubon is most know for his Birds of America Series consisting of 435 life size prints of over 700 North American birds, (the Red Shouldered Hawk below is part of the series) however there are several pieces of art in his personal collection which have never been reproduced or printed. While there have been various fine art reproductions of the Double Elephant Folio series the museum always thought improvements could still be made to not only return the art to original luster and vibrancy, but make prints available for sale to the public at an affordable price. Although Dave has quite a reputation in the art reproduction industry for doing phenomenal work, it is not where this story began. Our story into the world of JJ Audubon begins with a customer, fellow photographer, and good friend, Tom Wandel. In the fall of 2012, Tom Wandell traveled the Eastern United States on a photography tour. His mission, through his Indelible Images organization, is to assist wildlife and other conservation organizations with professional photographs and images for use in their educational and outreach efforts. After meeting with the curator and staff Tom was inspired and proposed an art reproduction and restoration project of not only the DE Bird Folio but various other Audubon art. Tom and the curator envisioned a partnership between the Audubon Museum in Henderson Kentucky and Hamilton Color Lab where Dave Hamilton would digitally capture and restore the art and both the museum and and Hamilton Color Lab could sell the prints, branded and authenticated with the JJ Audubon Museum Fine Art Collection seal. The first step has been completed, with two full days of photography at the museum capturing over 800 pieces of art, some the public has rarely seen, except in the Audubon family museum. Next came step two, selecting a few pieces from the Folio series to restore, print and send to the museum for approval and the go ahead to proceed with the remainder of the art. Now the real time consuming work begins, starting on the first book of the DE Folio. Eventually there will be four leather bound limited edition books, just like the original series and individual limited edition prints in the original size and one size smaller, printed on cotton rag archival paper using a Giclee printing process. Details have yet to be worked out regarding price, number of editions, and sizes. We are still in the beginning phases of this project. We are compiling a mailing list for those interested in purchasing any prints and invite you to complete the form below. Mailing address is not mandatory, but if you include it we will mail you notifications on the progress of the JJ Audubon Museum Fine Art Series. Categories: Art Reproductions, News & Info | Tags: announcement, antiques, art reproductions, birding, Fine art, giclee printing, history, John James Audubon, Kentucky, nebraska, news, omaha, ornithology, Red Shouldered Hawk, wildlife | Permalink.